"Chhaach (Chaas, Mattha, or Buttermilk)," Isha was teaching Hosh, "is a very popular beverage the world over. Originally, it was the nutritious liquid left behind after churning butter from cultured or fermented cream." "When cream splits, you end up with butter and whey. This whey is buttermilk, or Chhachh. Wherever you need to use yogurt in any recipe, you could also use buttermilk." 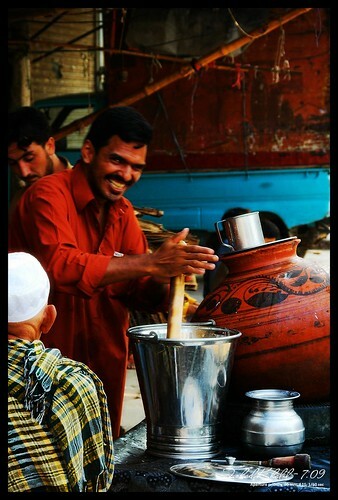 "It makes delicious Kerhi, cakes and pancakes. You can marinate chicken with it, or even use it as a healthy salad dressing instead of mayonnaise." "It is cheap, fast and easy to prepare, versatile and delicious. You can serve it to almost anyone, anywhere, anytime." "What sours the cream in the first place, Ma?" Hosh asked. "Milk contains a sugar called Lactose," she answered. "It also contains a harmless bacteria called Lactobacillus. Pasteurizing milk kills off harmful bacteria, but it also greatly reduces the number of Lactobacillus. Pasteurizing is what makes milk last up to three weeks in a fridge." "But Lactobacillus is a very useful bacterium. It converts Lactose into Lactic Acid. When Lactic Acid is formed, the pH of the milk drops, and it tastes sour." "Milk proteins, especially Casein, are no longer as soluble under acidic conditions, so they precipitate out, causing curdling or clabbering of milk. So, buttermilk gets both its tartness and thickness from Lactic Acid." "Other by-products of fermentation are what give subtle variations in the flavor of buttermilk." "The acidity of buttermilk is also why it keeps easily for weeks in the refrigerator. Acid is a natural preservative, because it inhibits the growth of pathogenic bacteria." "If you keep buttermilk in the fridge for longer, it may develop mold on the inner walls of the jar. This mold belongs to the same group of fungi which grow on cheese, and is not dangerous. Remove it, and the buttermilk can still be used for baking." "However, because the desired bacteria may have died in older samples, buttermilk older than three to four weeks may not work as an inoculum to make buttermilk." "In olden times, farm families would let freshly milked milk sit for half a day, and skim off the cream which had risen. This cream would be set aside in a cool place, around 50-60 Fahrenheit." "Each milking's cream would be added, until several gallons had accumulated. During this time, naturally occurring Lactic Acid-producing bacteria in the cream fermented it, causing it to slightly sour." "This greatly helped the separation of butter in the churning process, since fat from cream with a lower pH coalesces more readily than that of fresh cream. The acidic environment also helped stop potentially harmful microorganisms from growing, increasing its shelf-life." "So, the accumulated, slightly sour cream, churned easily, giving butter firm enough to separate out, but soft enough to stick together into a mass. This butter was removed, washed in very cold water to remove the remaining milk, and salted - to preserve it." "The shelf life of the remaining liquid, whey or buttermilk, did not exceed 4-5 hours, so it was usually drunk as soon as it was made. This natural or traditional buttermilk was slightly sour, had the consistency of milk, but was slightly paler." "You could see flakes of butter floating in it, but it really had no butter in it. In fact, it was very nutritious and healthy, as it had all the goodness but less calories and lower fat than in the whole milk." "However, after the cream separator machines were developed, there was no need to let the milk sit. Centrifugal force inside separators effortlessly separated cream from milk. The resulting cream was hardly acidic at all." "Cultured buttermilk, commonly available in supermarkets, is not the same as this 'old fashioned' buttermilk. Cultured buttermilk is thick and tart, while the old fashioned one was thin and slightly acidic, depending on how sour the cream got before it was churned." "Commercially available cultured buttermilk is milk that has been pasteurized and homogenized, and then inoculated with a culture of Lactococcus lactis (also known as Streptococcus lactis) and Leuconostoc citrovorum to simulate the bacteria which occurred naturally in the old-fashioned product." "Some commercial manufacturers also add colored 'butter flakes' to imitate the old fashioned flecks of butter that used to be left over from the churning process in traditional buttermilk." "Today, buttermilk also refers to a range of fermented milk drinks common in warm climates, for example in the Balkans, the Middle East, Turkey, Afghanistan, Pakistan, India, Sri Lanka and the Southern United States, where unrefrigerated fresh milk sours quickly." "Interestingly, various yoghourt drinks in colder climates, such as Scandinavia, Finland, Ireland, Netherlands, Germany, Poland, Slovakia and Czech Republic are also now marketed as buttermilk." "Anyway, traditional Chhaach (Chhas or Matthaa) is pretty sour, so it is best consumed chilled and salted, with or without added water." "My mouth is already watering, Ma," said Hosh. "Can we make some Chhaach now?" "Sure," she answered. "But I haven't got any cream, so I'll show you how to make salted Lassi in a way that it'll turn out to be pretty close to Chhaas." "It is a simple recipe," she said, when he had assembled everything. "Mix the ingredients well with a hand blender. Or whisk, if you want a bit more texture to your drink. Garnish with coriander or mint leaves, and serve chilled."